This blog has had a wholly inadequate number of Valentine's Day dinners. Mostly this is because we haven't really had that many Valentine's Day dinners together. In 2008 we were just a couple of months from starting this blog. In 2009 we were traveling to Rhode Island to see my Father for his birthday. In 2010 I was working and Jen was home sick and made herself creamed salmon on toast. In 2011 we had the first time since starting this blog nearly four years ago that we had anything resembling a nice meal. I made a non standard surf and turf of lamb and sea scallops. This got me to thinking of some Valentine's Days past. There was 2003 where I surprised Jen in New York and presented her with a menu to choose from any one of a number of dishes I couldn't actually afford to buy the ingredients for. In 2004 I made a nine course dinner in Rhode Island with expensive ingredients kindly donated by some restaurant friends of mine. In 2005 or 2006 (I can't remember which) we ordered pasta take out and watched a documentary on Russian Mail Order Brides. We remember this as both our best and worst Valentine's Day ever. The sadness has mellowed and turned into charm in the charred oak barrel of time. As was the case last year I had about twenty-five minutes to prepare dinner. 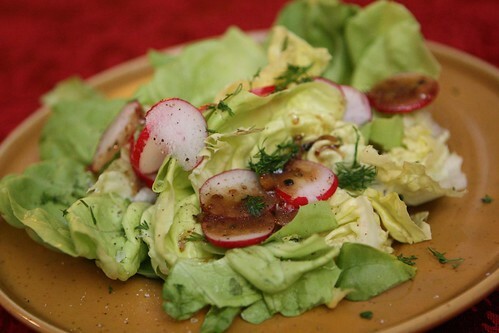 I had to do something simple for a salad while the pans heated up so I made this salad with butter lettuce, radish, dill, and some of Jen's salad dressing from the fridge. 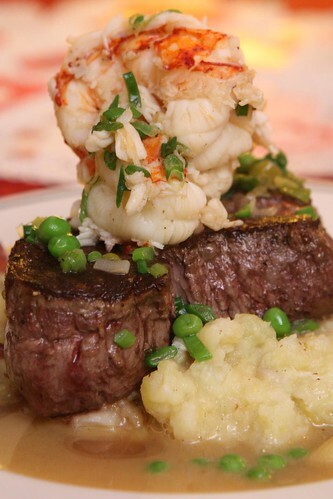 While last year I went with a non standard surf and turf, this year I decided to go with the classic: beef and lobster. I seasoned a beef tenderloin steak with salt and pepper, seared it in a pan, then threw it in the oven for about five or six minutes. After it was cooked I let it rest then threw some butter in the pan, cooked up some green onion, tossed in some English peas, the lobster tail which I'd previously boiled, and added some seafood stock and a little extra butter at the end. I served this all on top of mashed potatoes. I was going to drizzle a little truffle oil on the top but I made an assumption that Jen would hate that idea. During dinner I confirmed this assumption when Jen wrinkled her nose at the thought of truffles. It's unfortunate but it does save a bit of money. Money that can be spent on Jen getting me awesome beers! She is well-tuned to my beer aesthetic which is to say any beer that I haven't had before. She even bought me a beer that the guy at the store specifically warned her against because it was "too strange." 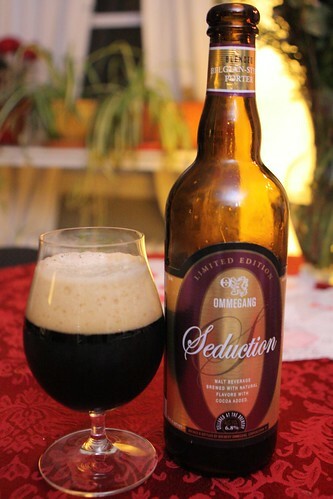 Speaking of beer, tonight I poured this limited release Seduction porter from Ommegang. 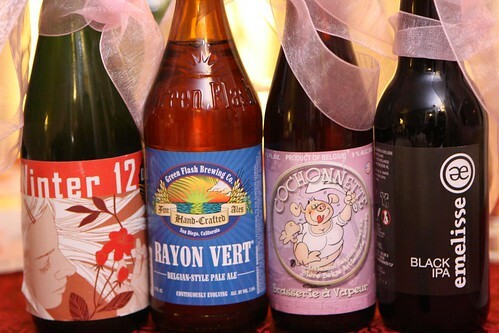 There aren't a whole lot of Valentine's Day beers out there but this is sort of one of them. A lot of beers talk about having chocolate notes but this beer actually has chocolate in it. I was expecting something quite a bit fruitier and, dare I say, girly, from a beer called Seduction. What I got was something a bit more complicated. It's a good thing that I asked Jen to be my Valentine and not her father. I'm pretty sure that once he reads about this beer he will start looking into ways to have our marriage annulled. Pairing dark heavy stouts with cheesecakes is nothing new but I was recently very impressed with one take on this using Young's Double Chocolate Stout from one of my favorite food and beer blogs, The Beer Cook. (Recipe here: Young's Double Chocolate Cheesecake). 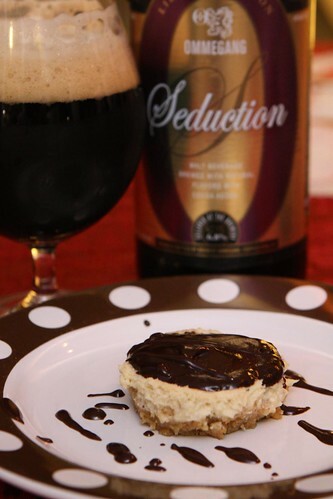 I set out to make my own version of this but I decided to use the Seduction beer. I made this last night and let Jen taste the batter which she did not like. Tonight, however, after it had baked and chilled overnight she actually went in for seconds. The beer worked quite well in the cheesecake even if it did look like an unholy mess. There you have it: another Valentine's Day that was better than the time we watched the documentary about Russian mail order brides. And yet, not quite as good.